How to win the war against ants! Did you know that ants are one of the most common pest, and in fact they can be a real nuisance once they decide that your home is now their home. Unfortunately for us ants can sniff out any good source of food which then leads to an infestation of these tiny little critters. All you need is one ant in your home before they signal other ants that your home has a good food source. It has been proven that ants will go along the same scent trail when they forage for food when they leave their nest. Here is an interesting fact, did you know that ants can carry up to 10 times their body weight. Firstly you need to Identify what type of ants you have? The first thing you need to do is to identify which type of ants you have. You may not know this but worldwide there are over 15,000 different species of ants. Black ants – loves their food source to be sweet, usually found in your kitchen/dining areas. Bull ants – feeds on sweet food sources but mainly feeds off animal carcasses. Carpenter ants – will feast on animal carcasses, plant fibres and sweet substances, usually sets nest in dead or dampwood. Argentine ants – travels a long way from their nest to source of sweet food sources but have been known to also feast on animal carcasses and insects. Coastal brown ant – will be found near pathways in and around your garden, prefers dry areas and will feast on greasy foods, fruit, sweet substances and animal carcasses. Ants will nest outside your home in rockeries, sheds, kid’s equipment, under pathways, subfloors or patios but Inside, their nests can be found in wall cavities, basements and roof voids. The first line of defence against ants in or around your home is to first make sure that you keep your home clean. Food scraps and crumbs are very attractive to these pesky ants as they are scavengers by nature and the only way to source food is to go foraging for food. Sweep up crumbs, make sure food is securely stored in airtight containers, put your pets bowel away after each meal, clean up sticky messes as the sugar attracts them. Call in the professionals to avoid ants getting out of control! 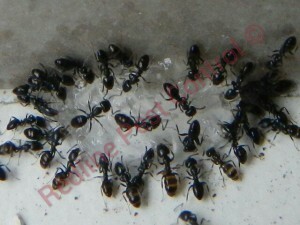 There are many ways that a reputable pest control company can deal with ants. Here at Redline Pest Control we feel that by providing a chemical barrier in and around your premises will leave you with lasting results. We have a proven method that works first by reducing the ants then a colony elimination, you ask how could that be, well first of all the chemical we use is a slow release chemical which allows the ants to take the chemical back to the nest, once the queen digest the chemical and passes over the other ants will no longer know what to do as they queen ant is the one that gives out the signals to the workers and soldiers. If there are no signals the ants do not know how to forage so therefore they will also die. Tips to keep Ants out of your home!